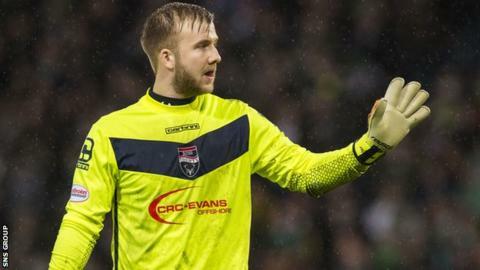 Ross County are likely to be without goalkeeper Scott Fox for the League Cup final against Hibernian on 13 March. Fox, 28, injured his knee during Saturday's 3-0 loss to Dundee United and will be replaced by Gary Woods for Tuesday's league trip to Kilmarnock. The club is waiting for the results of a scan, with manager Jim McIntyre estimating an absence of "probably at least four weeks" for Fox. Woods, on loan from Leyton Orient, has played in 10 games this season. The 25-year-old Englishman deputised for Fox in October and November after the first-choice keeper damaged his ankle. "Scott has had some outstanding performances and unfortunately for him he has had two injuries this season and both of them have been quite severe," added McIntyre. Following the home defeat to United at the weekend, McIntyre rebuffed the notion that his players may have been thinking ahead to the Hampden final. And, with a visit to Rugby Park and another meeting with the Tannadice club in the Scottish Cup to come before the showdown with Hibs, he warned that performances will need to improve. "We have lost a match, so it is how we bounce back," he said. "It is easy to turn round and say they have one eye on the cup final - it doesn't really work like that for me because if you are in poor form running up to it then there is a good chance of losing your place. "So from that side of things it was just a bad day at office."